Some big tablet headlines from this morning include some hard dates for upcoming and impressive looking Samsung Galaxy Tab. 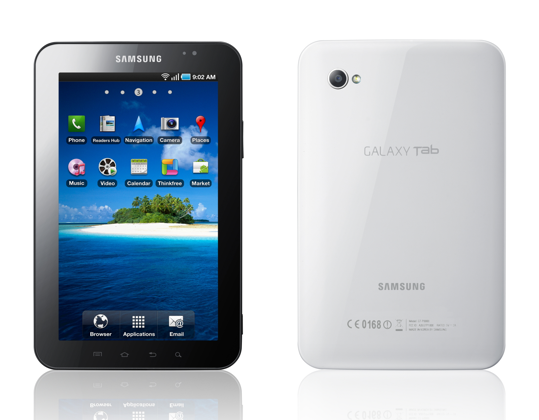 Verizon Wireless announced it has plans to sell the Android-powered Samsung Galaxy Tab for $600 starting on November 11th. That seems like a hefty number for a device that hopes to compete and/or knock-off the reigning tablet champion, Apple. That $600 pricetag is unsubsidized, meaning that once you pay the $600 you own the Android powered tablet outright. You won’t be held to any two-year contract with Verizon. They seem to be taking a page out of AT&T’s playbook and offering a month-to-month data plan, and not requiring a contract. Verizon Wireless has announced a $20 month-to-month data plan for Galaxy Tab, which will give the user up to 1Gbof mobile data on Verizon’s CDMA network. Although you wont be able to make any kind of voice-calls with the new Galaxy Tab, Verizon is 0ffering some of their unique services bundled into the package. They include, but no limited to V-CAST Music and V-CAST Song ID, VZ Navigator, Slacker Radio, Kindle for Android, Blockbuster On Demand, and the popular game called “Let’s Golf.” Users will also be able to send and receive text, picture, and video messaging, which is a big plus over the iPad. What do you think, is $600 to much for a new mobile tablet device? We still have yet to see anyone challenge the iPad, and remember it was Apple that set the high price point for the tablet industry. Previous Entry: Android 2.2 Froyo OTA Update for T-Mobile MyTouch 3G Has Begun!